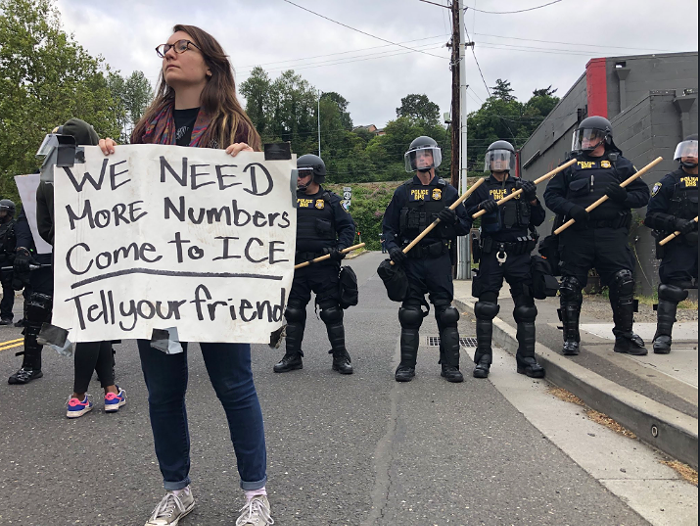 Seven people protesting in front of Portland's Immigration and Customs Enforcement (ICE) office have been arrested by federal police for failing to comply with officers' orders and blocking the building's entryways. All seven have since been released from custody, according to a news release from the US Attorney's Office for Oregon. “Freedom of speech and peaceful assembly are sacred rights enjoyed by all Americans and the U.S. Attorney’s Office is committed to protecting these rights," said Billy J. Williams, U.S. Attorney for the District of Oregon, in the release. "However, when individuals break the law by blocking employees and the public from accessing a federal facility, federal law enforcement will respond to restore normal business operations." About 50 police with the Department of Homeland Security arrived at the ICE office in riot uniforms this morning and proceeded to clear people off of the property. It's during this time that the majority of arrests took place. From 6 am onward, the DHS officers stood in a line, blocking off SW Bancroft street between SW Moody and SW Macadam avenues. According to Robert Sperling, a DHS spokesperson, the officers "will have a presence for a while" to ensure the protesters don't re-enter the federal property. He says the ICE office will probably reopen next week. The majority of the protest camp, which sits on TriMet property, has remained largely untouched by law enforcement. Activist Jacob Bureros, however, told reporters that officers dressed in plainclothes stole a few cell phone from the camp's charging table this morning. According to the news release, the seven charged protesters will return to court on September 7.